I can’t post an image of ones I’ve made because I gave them to a friend who needed them. ❤ I’m using the one that came with the printed pattern a friend gave me. I used Caron Simply Soft yarn in pastels, but that’s just me. An “H” hook worked beautifully. Foundation: ch 5, sl st to form a ring. Repeat rows 7 & 8 until you have reached the desired length of the hat. 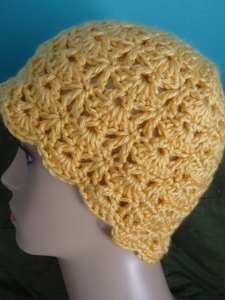 Be sure to end on a row of shells so that your hat has a scalloped finish. *** To reduce this to a young-grade-school size hat, start with 11 dc total in the first round. *** To reduce this to a baby-size to 2 year old hat, start with 9 dc total in the first round. This isn’t my pattern. I have a print out that a friend gave me when I over-stocked up on Caron Simply Soft yarn a few years ago. If you don’t have a cancer care center close to where you live that will take donations, you can surf on over to Crochet for Cancer’s website to view guidelines and locations of oncology centers that you can send your caps to. They even have patterns you can download and make. I’ve lost too many friends and loved ones to cancer to NOT crochet a cap when I have some spare time, and I hope that you will, too. This entry was posted in Crochet, DIY, Of Interest, Random Acts of Kindness and tagged Chemo caps, crochet pattern, donate chemo caps. Bookmark the permalink. Hi there! Thank you for sharing this pattern. I am now following your blog. I appreciate you liking my comment on Rose Buds on Border Crochet Scarf. Perhaps you would like my blog, I invite you to visit it and let me know. So nice to meet you, Cathy! Heading that way right now. 🙂 The color choices you mentioned on the Rose Buds on Border blog sound so pretty! Those are so adorable, and it’s so thoughtful of you to make them. When our Dan was in the hospital after his cancer surgery, one of my coworkers gave me a crocheted coverlet to take to him. It had been made by members of her church – she said they do that whenever they hear of someone battling cancer. Dan was touched, and he kept that coverlet with him right to the bitter end. Little things like that can mean so much. The one “big” thing that I tend to donate time/money/goods to is anything relating to cancer. My mom is a two time breast cancer survivor, my dad’s a survivor, and the hubs’ former boss’s wife is a survivor, as well. I’ve lost friends, too, so whatever I can do, I try to do.